The 4.3 inch (11 cm) Spacer provides additional height for better access. The Spacer cannot be used with the 2100-Sheet Tray. The optional caster base may be required when the product is configured with the spacer or additional trays (1 to 4). 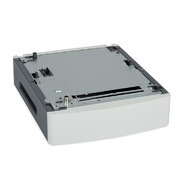 Go to www.lexmark.com/multifunctionprinters for more information.